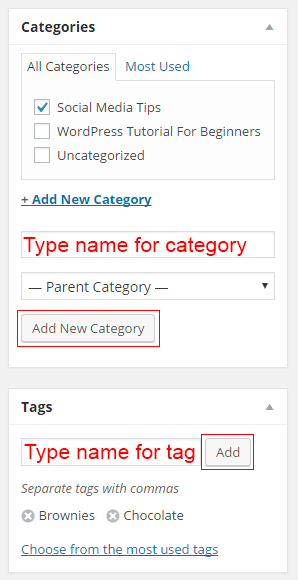 You are here: Home / WordPress Tutorial For Beginners / How do I organize my content using categories and tags? This is a condensed version of the post below. WordPress websites have web pages and blog posts. Make an About Us page, Contact Us page, Testimonials page and any other page you want to include in the main navigation bar at the top of your site. But for the bulk of your website content, do not use pages, use posts. Think of 4 categories that accurately describe your site’s content. 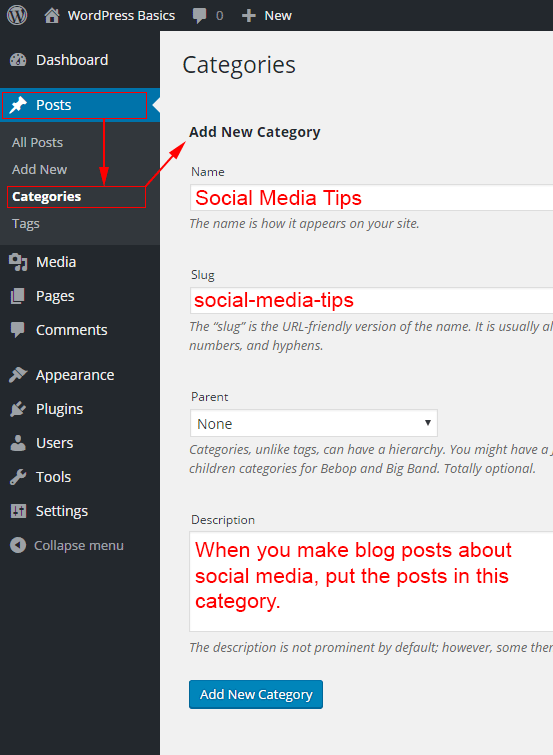 Make those categories inside your WordPress website, then as you make each new post assign that post to the relevant category. By linking directly to any category, you can display all posts in your website that are on that topic. These are some facts you need to know before you start to make web pages or blog posts for your website. 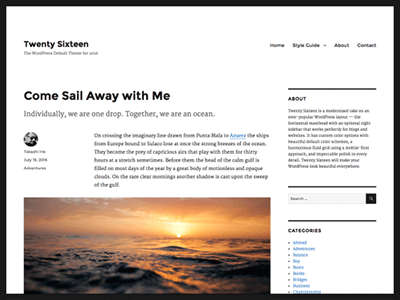 The two main ways to add content to your WordPress website are pages and posts. Most site owners only use pages for things like their contact us page or their about us page. Most WordPress websites have a relatively small number of pages. Most of the content in a WordPress website is displayed using posts, which are sometimes called blog posts. All of these pages are referred to as static pages. These are typically the pages you would see listed in the navigation bar at the top of your website. Posts are designed to be used when you want to write an article that your site visitors will enjoy reading or find useful. When should I keep my dog on a lead? How to help your puppy make new friends. Should you take your dog to a dog obedience class? Posts, or blog posts can be organised into categories. 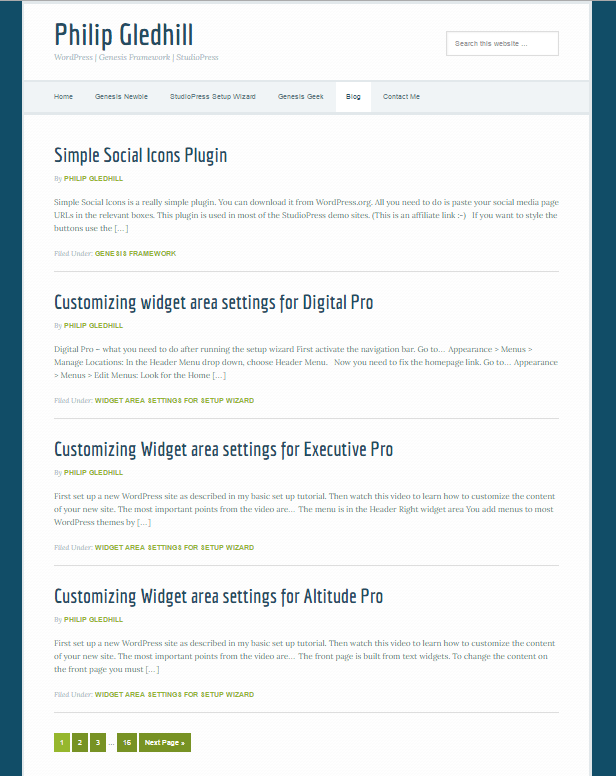 Posts can be organised in even more detail using tags. As your website grows this ability to organise your content becomes more and more important. For instance you might have a category called social media tips. To view the category and see all of your posts about social media you would just visit the relevant page on your website. If you have more than a few basic pages on your site I highly recommend that you use POSTS for most of your content. 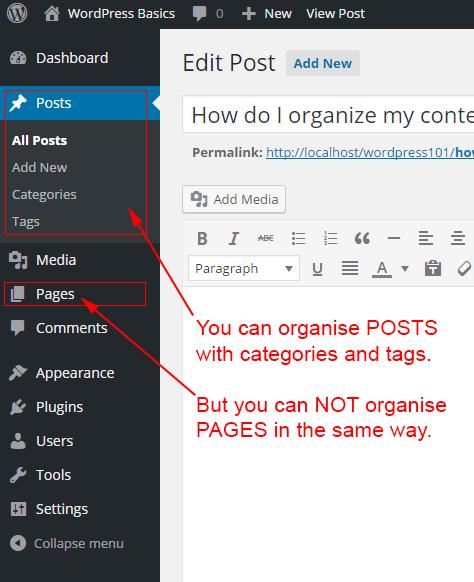 Then think carefully and find 4 to 6 basic categories that you can use to organise your POSTS (content) into. Don’t make too many categories in your new site. If, over time, your site grows and you decide you need more categories, you can easily add them later. And you can move posts from one category to another, if you need to. Let’s say you’re about to post a recipe for brownies on your food blog. You’d probably want to use categories like “Dessert” and “Baking”, and tags like “Chocolate”, “Brownies” and “Walnuts”. Use categories for your main topics. Use tags for other, less specific, supporting terms. Start as you mean to go on. Think of the main topics your website will be about. Then make a category for each topic. Try not to make more than 4 categories for a brand new website. You can always add more in the future. Previous Post: « How do I edit my profile picture, add some biographical information and reset my password?